Last night, John Hirschbeck ejected Troy Tulowitzki from game three of the ALCS after Tulowitzki complained about Hirschbeck’s called strikes against him in his previous at-bat as he took the field for the top of the eighth inning. “I think it was obvious I didn’t agree with the called third strike,” Tulowitzki said. “And there were other pitches that were questionable. I’m walking out to the field, and he’s looking at me. And I told him that wasn’t a strike. And it was a quick trigger. Obviously he was either holding on to something or something was going on. But I didn’t think what I did was going to eject me from the game. Clearly, the bar for what constitutes an ejection should be higher in the postseason; the stakes are so high, the last thing the league should want is a game being decided by backups forced into the game because an umpire had a short fuse. So it would be interesting to hear Hirschbeck’s side, and his rationale for why he had to eject Toronto’s shortstop from the game. Unless he provides a compelling alternate version of events, this event won’t help his reputation as an umpire with too quick of a hook. But, without defending the ejection, it should be noted that Tulowitzki was wrong about the pitch that ultimately got him ejected. In fact, the Blue Jays complaints about the strike zone seem pretty weak when you actually look at the balls and strikes Hirschbeck called last night. Here’s our strikezone plot from the game last night, with the called strike three to Tulowitzki circled. And here is the strike zone map from Brooks Baseball. According to the PITCHF/x data, the pitch was on the outside corner, and should have been called a strike, even before accounting for the fact that the called strike zone against right-handed batters often stretches a little bit off the plate. This pitch wasn’t even in that borderline area, so Tulo doesn’t seem to have much of a case here. That pitch was part of a cluster of outside corner calls down in the zone, and every pitch in that cluster was called a strike by Hirschbeck last night. If anyone should have been complaining about Hirschbeck’s zone last night, it should have been the pitchers, because his zone was actually pretty tight for most of the evening. The first pitch Johnny Cueto threw last night was a changeup on the inside corner to Ben Revere, but Hirschbeck called it a ball. Marcus Stroman later threw Mike Moustakas a curveball in a very similar spot that also was called a ball, despite the fact that it was pretty clearly in the strike zone, and then Hirschbeck also missed a first-pitch two seamer from Stroman to Lorenzo Cain that should have been strike one. But the most notable part of Hirschbeck’s zone last night was that he was not giving pitches off the plate against right-handed batters, no matter how often each team tried to get strikes there. 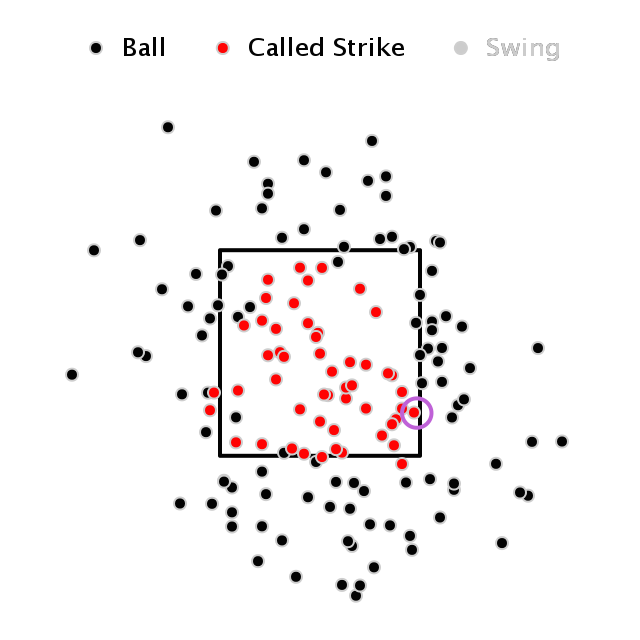 You can see all those black dots right on the line and just off the edge map; these pitches are called strikes with a decent amount of regularity during the season, but last night, Hirschbeck was not giving those just-off-the-edge pitches. In fact, Tulowitzki had already benefited from one of those close calls. In his first at-bat, Cueto threw him an 0-1 fastball right off the outer edge, and almost perfectly centered vertically, but Tulo took it for ball one, then singled on the next pitch of the at-bat. Despite his protestations, Tulo didn’t really have any calls go against him last night, and perhaps Hirschbeck was more defensive than usual because of the fact that he knew Tulo was simply wrong in his criticism. That alone doesn’t excuse an ejection, of course, and players should be allowed leeway even if they perceive the call incorrectly. But given that Hirschbeck’s zone was pretty hitter-friendly last night, I can somewhat sympathize with not taking too much grief from a hitter about an accurate strike call. Depending on what Tulo said between innings, Hirschbeck perhaps should have just ignored the comment, let the situation die out, and finish out the rest of the game, enjoying the justification the evidence would bring postgame. Instead, he’ll now have to explain (to his bosses, at least, if not the public) why he ejected a player who was so far away from him and didn’t seem to be escalating the situation at that point. But when it comes to the call that Tulowitzki was complaining about, it seems like Hirschbeck has some ground to stand on. It was a good pitch, and Hirschbeck got the call right. We hoped you liked reading Defending John Hirschbeck, Somewhat by Dave Cameron! Any time an umpire comes out like that to challenge a player, they are in the wrong. Doesn’t matter if he made the correct call on the pitch. It’s the friggin ALCS and he tosses a guy for responding to his own goading, after the inning had turned over and the players had gone to their positions. Unacceptable. Agreed. The ejection is the issue, not the strike call. The question of whether the player’s gripe with the strike call was ‘legitimate’ or not is completely separate. You get ejected for arguing balls and strikes regardless of the merits of the those calls. So the merits of the *ejection* are the issue. And from where I sit, there’s nothing to talk about. I can’t think of a single excuse for it, let alone a good argument. Oh please. The challenge was at the plate, Tulo knows Hirschbeck. Knowing the rules, written and un-, Tulo screwed the pooch. Now STFU and play baseball.